Cartridge filter housings are very widely applied in the water treatment market. When we scheme a filter cartridge housing for a project, normally we have below concerns to take into consideration. In other words, we need to consider the raw material used and the design of the cartridge filter housing. Stainless steel, FRP, UPVC and PVDF are all can be used to fabricate the cartridge filter housings. Brother Filtration can supply all the above types. Regarding stainless steel, we include SUS304, SUS316, carbon steel, mild steel, duplex SS and Super duplex SS, etc. for high temp and high pressure operations. 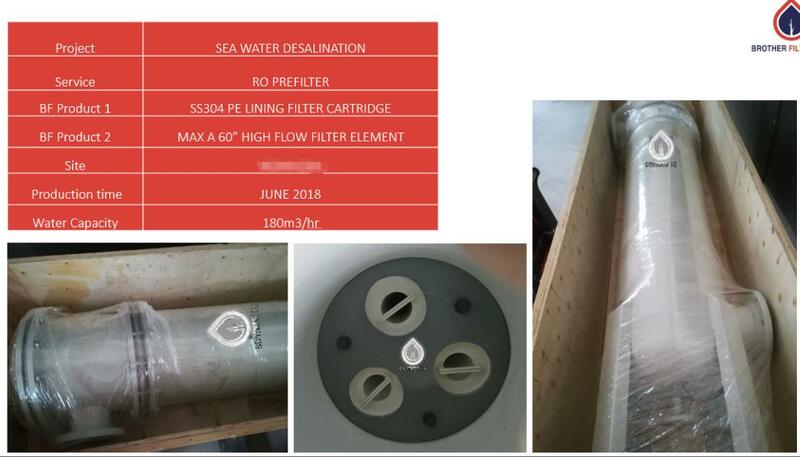 And other material like FRP, UPVC, PVDF cartridge filter housings are especially used in the chemical and sea water filtration applications. Here below we will give you an overall idea of the procedures to make a stainless steel cartridge filter housings. After the engineer finishes designing the housing. Workshop will start the fabrication. We firstly need to get all the raw material ready. Quality inspection needed before we put the raw material into warehouse and workshop. Scratches, spots on the steel plate are not allowed. Then according to the drawings, we make the cartridge filter body and spare parts. Get the in/outlets, vent and drain port holes ready before welding. If this cartridge filter housing is a sanitary type or surface finish needs to be polished, we need to advance the polishing step. If not, we can then go to next step welding. Don’t think welding is easy, it is the most crucial part when producing a cartridge filter housing. Because a cartridge filter housing is also a type of pressure vessel. For pressure vessels, welding decides if it can function as expected. So welding is also an important factor to judge a good housing filter. A high quality welding seam is welded completely and neatly. When spare parts like flanges, closures, in/outlets and maybe swing arms are all welded, we will first do the hydro test to make sure the quality and then do the surface finish processing. For a stainless steel cartridge filter housing, surface finish can be sandblasting, beadblasting, mechanical polishing, electro polishing and painting. After the surface finishing, then we can present you a perfect housing product.